Fixation of fractures and osteotomies has progressed dramatically with the advent of internal fixation. Before internal fixation, most fractures were placed in casts and anatomic fixation was difficult to achieve. In the mid-1950s, screw fixation was intro- duced by the AO Foundation with carpentry techniques used to fixate bone. Over the course of 60 years, fixation has been advanced to include cannulated systems, head- less systems, different plate/screw combinations, and some absorbable or allograft bone fixation options. However, there has been little advancement that has dramati- cally and significantly changed fixation techniques from a biomaterial standpoint, with the main material used still being nonabsorbable steel or titanium. Metal, in any form, is an excellent fixation material. However, metal has downsides. On a positive note, metal is inert and does not cause much reaction as long as the pa- tient does not have a metal allergy. Second, it offers a solid fixation that is stronger than bone and adds significant strength to a fracture or osteotomy fixation. On the negative side, metal screws may need to be removed and the AO Foundation recommends removal of hardware, which requires a second surgery. Metal also is not good for imaging and often gives off significant signal with both MRI and computed tomography imaging. In addition, hardware removal may be difficult, with screw strip- ping and breakage, and can leave the bone hollow in the region of hardware removal, resulting in bone weakness. Absorbable hardware has been attempted several times in orthopedic fixation. Most of the material previously used was made out of suture material stranded together. The problem with absorbable material has been that the absorption usually occurs all at once with what is called a burst effect, which means that the material degrades significantly and all at once through an acidic process causing cystic changes and leaving the bone exposed to weakness in the region of absorption. Furthermore, the region of absorption has, at times, formed cystic changes that can be painful and grow with time within the bone. In addition, there has been no absorbable material, other than bone, that has offered support and adjustable strength. Such a material would be ideal because it would allow the transfer of strength to the bone slowly while the material is replaced by new bone formation for added strength and stability. 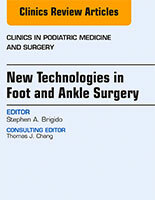 Bone allograft has become popular in foot and ankle fixation. The bone is milled into the shape of pins and plugs that are press fitted into the bone. This technique offers su- perior benefits to previous absorbable materials because bone can grow into the allo- graft and allow additional stability; bone allograft rarely needs to be removed; can be cut through, which allows ease of secondary surgery options; and is fairly inert. However, bone allografts have sterility and infection risks. The bone materials also differ in strength depending on the quality of the allograft material, which may differ from person to person. Bone pins or screws also cannot be modified for surgical location–specific strength and absorption options. In addition, the bone material can be brittle during insertion, resulting in fracture or stripping of the hardware during insertion. This risk means that the bone is mainly used as a plug or pin and cannot offer rigid fixation or compression. 1. Strength comparable with or greater than the bone that is being fixated, with slow decrease in strength to allow the bone to increase its strength. 2. Absorption of the material in a timely and quiescent manner without burst effect. 3. Replacement of the fixation material with bone to allow for strength, and negate the risk of cysts or hollow bone regions in a slow and sustained manner. 4. Ability to achieve rigid fixation and compression from the material, with multiple forms of fixation being possible in the form of screws, plates, pins, and rods. 5. No need for removal of the material. If all of these qualities were to be met, absorbable fixation would be superior to nonabsorbable fixation because there would be all the benefits of metal fixation with additional benefits of an ideal absorbable material. If the ideal material could then be further advanced, there would be the added benefits of a material that degrades adequately, allowing the surrounding bone to acquire more strength in a timely manner that could be adjusted for time based on how long each bone and region needs to be protected, and that could also encourage new bone growth in the region of fixation, which would strengthen the bone that is being fixated. Essentially, what is needed is a material that stabilizes the bone with rigid fixation, absorbs gradually, allows the body grow bone in its place, and acts like a bone graft strut in the region of fixation. Ambrose and Clanton1 noted that, in addition to the information discussed earlier, the degradation of absorbable implants can allow a gradual transference of load from the implant to the bone, thus stimulating robust bone healing. Polylactic acid (PLA) and polyglycolic acid (PGA) and their copolymers have historical- ly been among the most commonly used bioabsorbable polymers in orthopedic implants. Additional polymers, including poly[ortho esters], poly[glycolide-co- trimethylene carbonate], poly[dioxanone], poly[e-caprolactone], and poly[b- hydroxybutyrate] implants are also available. However, most of the commercially available implants are still made of PGA and PLA or their copolymers. These bio- absorbable polymer devices are manufactured in the form of pins, screws, plates, rods, tacks, and suture anchors. PGA is hydrophilic and highly crystallic. Degradation and strength loss occur early and lead to postoperative complications. PLA is more hydrophobic. Two isomers of PLA, the L-isomer and the D-isomer, have different properties. The L-isomer (poly-L- lactic acid [PLLA]) is hydrophobic and crystallic, with prolonged degradation time (up to several years), which makes it similar to nondegradable materials (in vivo behavior) and leads to late adverse reactions at the final stages of polymer degrada- tion. The D-isomer is amorphous and less stable, properties that proved to be advan- tageous in building copolymers with the L-isomer. However, adverse biological reactions to resorbable implants can present in varying levels of severity from mild fluid accumulation to discharging sinus formation to irre- versible tissue damage. Although sometimes the reactions are mild enough to have no effect on the long-term outcome, in several studies, the reactions have been mod- erate to severe and have necessitated second surgeries. In most cases, the histologic picture is consistent. Polymeric debris is usually visible, both extracellularly and intra- cellularly, and osteolytic lesions are often found. Many factors affect the degradation of the polymer and the resulting reaction of the body to the polymer, including implant material, implant geometry, site of implantation, and method of sterilization. The re- sults of the many published clinical trials show some common complications resulting from the widespread use of resorbable implants. More recently, several companies have commercially introduced new orthopedic implant devices in an effort to mitigate the problematic inflammatory local tissue response of bioabsorbable polymer implants by mixing powder of various mineral compositions into the bioabsorbable polymer compositions to create bio- composites. Some companies mixed in powder of tricalcium phosphate (Bioretec) or biphasic calcium phosphate (Arthrex), some mixed in hydroxyapatite (Takiron), some mixed in calcium sulfate, and some companies use mixtures of these pow- ders (Stryker, Smith & Nephew). Such biocomposite implants usually incorporate 30% to 40% mineral content and the mineral content is entirely in the form of a fine powder, mixed into the polymer matrix. In all cases, the mineral powder is distributed homogeneously into the polymer composition. The mineral content in these implants can increase the brittleness of the implant because the mechanical strength of these implants derives primarily from the polymer and there is less polymer because of the mineral additives. This brittleness or weakness can lead to implant failure during insertion or subsequently in the postoperative period. Because of the limited mechanical strength, biocomposite and bioabsorbable implants have been limited to specific clinical indications that do not require load- bearing levels of mechanical strength. The primary clinical indication for these biocomposite implants is in orthopedic sports medicine for soft tissue attachment (anterior cruciate ligament [ACL] interference screws, suture anchors, biotenodesis), in which cortical bone level strength is not required. Thus, despite tremendous progress in biomaterials and bioabsorbable bone im- plants, surgeons and patients are still concerned with adverse tissue reactions caused by the degradation products of currently available bioresorbable orthopedic implant devices.5 A strong clinical need remains for orthopedic implants that can provide me- chanically secure fixation, integrate into the local tissue environment, and maintain an excellent in vivo safety and biocompatibility profile. The fibers provide superior mechanical properties to the implant and encourage bone ingrowth, whereas the polymer resin binds the fibers together into a cohesive element (Fig. 1).The reinforced mineral fibers are composed of a mineral blend that in- cludes calcium, silica, magnesium, phosphorus, and several other minerals. This type of mineral blend is used in granule, putty, or paste form in several commercial (US Food and Drug Administration and CE [Conformite´ Europe´ ene] mark approved) synthetic bone filler products. These synthetic mineral fibers have been shown both in vitro and in vivo to be osteoconductive; ie, supporting bone growth and regenera- tion. The content of reinforcing mineral fibers within the reinforced biocomposite is more than 50%. This mineral content level is significantly greater than that of any commercially available biocomposite implant product. The reinforced biocomposite .implants undergo a progressive and balanced degradation process caused by the internal structure of the implants wherein the mineral fibers provide degradation chan- nels that balance the polymer breakdown products. As such, these implants are not faced with the problematic inflammatory reaction seen in the current generation of biocomposite products. The mineral fiber content of reinforced biocomposites is integrated into bone. This process of biointegration is similar to the integration of synthetic bone filler products into the bone as the bone heals. The space that was filled with bone filler becomes filled with healthy bone. As the operated implantation site (bone fracture or osteot- omy) gains strength during healing, the reinforced biocomposite implants gradually lose their strength, although they maintain their function for at least 12 weeks. Com- plete bone integration ultimately takes place, effectively eliminating the need for implant removal surgery. Reinforced biocomposite technology is unique in that the internal structure of each implant can be adapted to create the optimal biomechanical profile for that implant. This process is done by designing implants that are composed of thou- sands of mineral reinforcing fibers. The fibers can be aligned into fiber bundles that can be built into a variety of different structures. Fibers are oriented to provide mechanical properties in different mechanical axes. Within a single implant, there are thousands of distinct oriented fibers that provide the mechanical properties for that implant. This process allows improved strength during insertion into bone because these implants do not bend or break easily during insertion. Because the previous bio- absorbable pins are much weaker than cortical bone, the insertion process into bone can result in high forces on the implant from the bone, which can cause it to break. This risk applies especially to implants of small diameter, such as pins or small screws. The biopolymer content of the reinforced biocomposite material degrades by hydrolysis into alpha-hydroxy acids that are metabolized by the body. The mineral fiber content of the reinforced biocomposite is integrated and remodeled into bone. Essentially, within the reinforced biocomposite material implants, two biological mechanisms occur concurrently: biopolymer bioresorption and mineral fiber bio- integration. This hybrid material degradation mechanism enables that the absorption of the implants is pH balanced because the alpha-hydroxy acidic degradation prod- ucts of the biopolymer are balanced by the alkaline degradation products of the min- eral fibers. The hybrid degradation profile has great benefit in that it is balanced, progressive, and gradual. Interconnected pores are formed through the implant that allow fluid flow through the implant and potentially support physiologic regeneration of bone tissue in place of the implant as the implant degrades. In previous bioabsorbable and biocomposite implants, the degradation profile was dominated by polymer bioresorption. Thus, there was suboptimal pH balance to miti- gate the acidic degradation products of the polymer. There were no interconnected pores formed through the implant to allow gradual and progressive clearance of degradation products. The large biopolymer chains simply became weaker and weaker in place until, eventually, a burst release of acidic degradation products occurred. Because of the large size of the polymer chains, this burst release could occur even after several years and result in a severe local inflammatory reaction at the implant site years after the implant was introduced. The reinforced biocomposite implants mechanistically avoid the burst release and inflammatory concerns that have been associated with previous bioabsorbable and biocomposite implants primarily because of a hybrid degradation profile that results in a balanced pH environment and interconnected pores that gradually and progres- sively allow fluid flow and clearance of degradation products from the local area of the implant. These factors result in a bioresorption profile in which the implant is safely and securely integrated into the local bone environment. The accumulation of biopolymer degradation products seen with previous bioabsorbable implants is avoided. Each reinforced biocomposite bone and soft tissue fixation implant is mechanically tested across multiple mechanical testing models in order to verify that the implant meets the specific biomechanical standards for the specified clinical indication. These tests can include bending force, shear force, tensile force, compressive force, torque resistance, and pull-out force. The reinforced biocomposite implant must be at least as strong as an existing orthopedic implant that has been previously approved for that clinical indication across all relevant mechanical measures. Although each mechanical test is important in its own right, bending force can serve as a useful mechanical strength benchmark for many bone fixation implants because the bending axis is frequently the weak link in the mechanical performance of an implant. Therefore, it is crucial to assess whether an orthopedic implant’s strength is sufficient to resist bending forces. When the bending modulus and strength that can be achieved with reinforced biocomposite is compared with those of bio- absorbable polymers (such as PLLA and self-reinforced PLLA) in the context of the mechanical properties of cortical bone, it becomes clear that these polymers are far short of having the mechanical properties necessary to provide adequate fixation and reduction of bone. Only reinforced biocomposite has sufficient flexural modulus and strength to adequately fixate bone in load-bearing applications. In order to show the osteoconductive properties of the reinforced biocomposite implant technology, an in-bone implantation study was performed. Reinforced biocomposite implants, 2 mm outer diameter, 1 mm inner diameter, 6 mm in length, were implanted unicortically into the mid-shaft of the right femur of rabbits. Absorbable polymer implants of the same outer diameter (without a lumen) were implanted in the same fashion into the contra-lateral femur for comparison. Femurs, implant sites and relevant lymph nodes were collected and evaluated at 4, 13, and 26 weeks to assess the potential for local irritation as well as to determine the bioresorption profile and osseous tissue ingrowth/integration into the implants. The bioresorption profile timelines differed greatly between the reinforced bio- composite and the polymer implants. The reinforced biocomposite implant showed evidence of substantial bioresorption of the polymer component through 26 weeks, as assessed by phagocytic activity. The absorbable polymer implant used for compar- ison showed only minimal evidence of fragmentation of the device at 26 weeks without evidence of an active or significant bioresorption process. No evidence of safety concerns or adverse effects were documented throughout the study. Advancement in orthopedics have been increasing rapidly. The most important advances have been in fixation. With time, metallic hardware will begin to be replaced by novel biomaterials that become one with the body. This progress will not only aid in the repair process it will allow permanent and improved reinforcement of the fixated region. Over time, it is expected that plates, screws, pins, interference screws, and even possibly joint replacements will incorporate into patients’ bodies, negating the need for hardware removal and adding structure and stability to an iatrogenically weakened area. 1. Ambrose CG, Clanton TO. Bioabsorbable implants: review of clinical experience in orthopedic surgery. Ann Biomed Eng 2004;32(1):171–7. 2. Kontakis GM, Pagkalos JE, Tosounidis TI, et al. Bioabsorbable materials in ortho- paedics. Acta Orthop Belg 2007;73:159–69. 3. Cox CL, Spindler KP, Leonard JP, et al. Do newer-generation bioabsorbable screws become incorporated into bone at two years after ACL reconstruction with patellar tendon graft? A cohort study. J Bone Joint Surg Am 2014;96:244–50. 4. Mascarenhas R, Saltzman BM, Sayegh ET, et al. Bioabsorbable versus metallic interference screws in anterior cruciate ligament reconstruction: a systematic re- view of overlapping meta-analyses. Arthroscopy 2015;31(3):561–8. 5. Konan S, Haddad FS. A clinical review of bioabsorbable interference screws and their adverse effects in anterior cruciate ligament reconstruction surgery. Knee 2009;16(1):6–13.